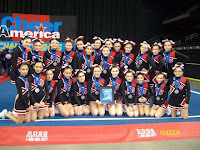 VETERANS MIDDLE SCHOOL – Congratulations to the Veterans Middle School Diamondettes for earning the 1st Place Trophy at the Cheer America Cheer and Dance Championship in Corpus Christi on January 16, 2011. VMS is extremely proud of the Diamondettes who practiced diligently and also thanks the parents and coaches for their dedication and support to the team. Members of the Diamondettes are Lizbeth Alanis, Yarely Alaniz, Ashley Arredondo, Odaliz Barrera, Andrea Barron, Jackie Garcia, Priscilla Garza, Paulina Martinez, Julaika Moreno, Jaslyn Resendez, Claudia V. Saldivar, Victoria Salinas, Cecilia Solis, Reyna Villarreal, Denise De Leon, Guadalupe Hernandez, Priscila Leal, Jovita C. Gonzalez (Coach), and Brenda L. Garza (Coach). VETERANS MIDDLE SCHOOL – Congratulations to the Veterans Middle School Cheerleaders for a double win at their last two competitions. 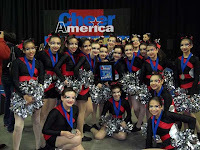 VMS Cheerleaders received the 1st Place Trophy at the Cheer America Cheer and Dance Championship that was held in Corpus Christi on January 16, 2011. They also earned the 1st Place Trophy at the 1st Annual Grulla Middle School November Fest Cheer and Dance Competition held at Joe R. Sanchez Stadium. VMS would like to recognize and thank the dedication and support of the parents and the coaches. VMS Cheerleaders are Alexa Posas (Co-Captain), Celeste Cantu, Anikah Garcia, Yolanda Gomez, Meagan Munoz, Shania Ramirez, Annalis Reyes, Kendra Trevino, Yalimar Villarreal, Zoe Zamarron, Victoria Aguilar, Victoria Beltran, Delian Canales, Arilyet Cantu, Tiffany Garza, Tiffany Gomez, Leslie Rios, Clarissa Villarreal, Megan Silva (Captain), Carina Ibanez (8th Grade Co-Captain), Ashley Falcon, Ana Garza, Carisa Ibanez, Gloria A. Vargas, Alexandra Zurita, Jackie Hernandez (7th Grade Co-Captain), Maggie Rodriguez (Coach), and Evelyn Escobar (Assistant Coach).